It's funny how something stands out like a sore thumb when it disrupts your daily routines. This evening I returned home from work and went up to the bedroom to open the windows as usual. 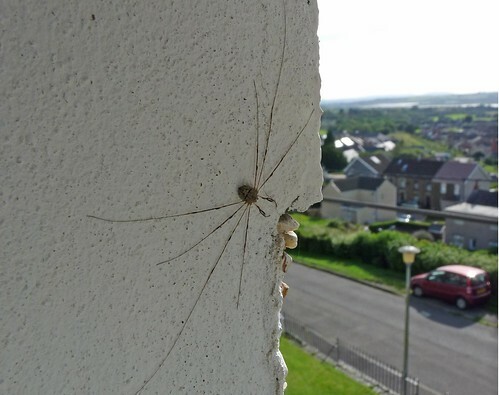 My eye was immediately drawn to a spider on the outside wall which had possibly the longest legs that I have ever seen. A post over on the Wild About Britain forum quickly had it identified as Dicranopalpus Ramosus, a species of Harvestman. This spider is usually visible from August to November, mostly in gardens and on outer walls. Looking at the distribution maps for the UK on the National Biodiversity Network Gateway this is not a particularly wide spread species but it does appear to like South Wales. I'd better not tell the girlfriend as she is not a fan of spiders at the best of times, let alone one with with such huge legs.